Historical data provide a baseline for judging how anomalous recent temperature changes are and for assessing the degree to which organisms are likely to be adversely affected by current or future warming. Climate histories are commonly reconstructed from a variety of sources, including ice cores, tree rings, and sediment. Tree-ring data, being the most abundant for recent centuries, tend to dominate reconstructions. There are reasons to believe that tree ring data may not properly capture long-term climate changes. In this study, eighteen 2000-year-long series were obtained that were not based on tree ring data. Data in each series were smoothed with a 30-year running mean. All data were then converted to anomalies by subtracting the mean of each series from that series. The overall mean series was then computed by simple averaging. The mean time series shows quite coherent structure. The mean series shows the Medieval Warm Period (MWP) and Little Ice Age (LIA) quite clearly, with the MWP being approximately 0.3°C warmer than 20th century values at these eighteen sites. Energy & Environment · Vol. 18, No. 7+8, 2007, A 2000-YEAR GLOBAL TEMPERATURE RECONSTRUCTION BASED ON NON-TREERING PROXIES, Craig Loehle, Ph.D.
Energy & Environment · Vol. 19, No. 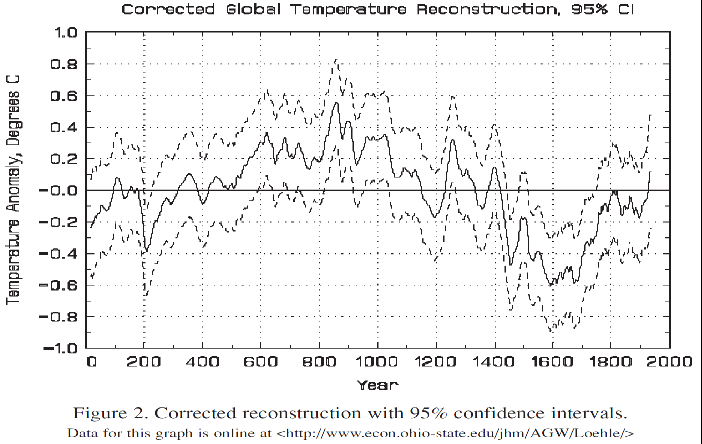 1, 2008, CORRECTION TO: A 2000-YEAR GLOBAL TEMPERATURE RECONSTRUCTION BASED ON NON-TREE RING PROXIES, Craig Loehle, Ph.D.